A joyous return to a forgotten favourite: Zheng Hao Chinese Restaurant on Enmore Road. It's been too long since our previous visit to Zhenghou Chinese Restaurant. It's cheap and it's good, and the ladies who run the joint greet us like old friends, even though they would have no way of remembering us. These folks are just so kind and friendly. The joint has had a makeover since our last post, it's still a hole-in-the-wall joint, but a nicer space to loiter in. The menu is part northern style Chinese with dumplings, Shanghai specialities and noodles; plus the usual Aussie chop suey stuff. There's something for everyone. 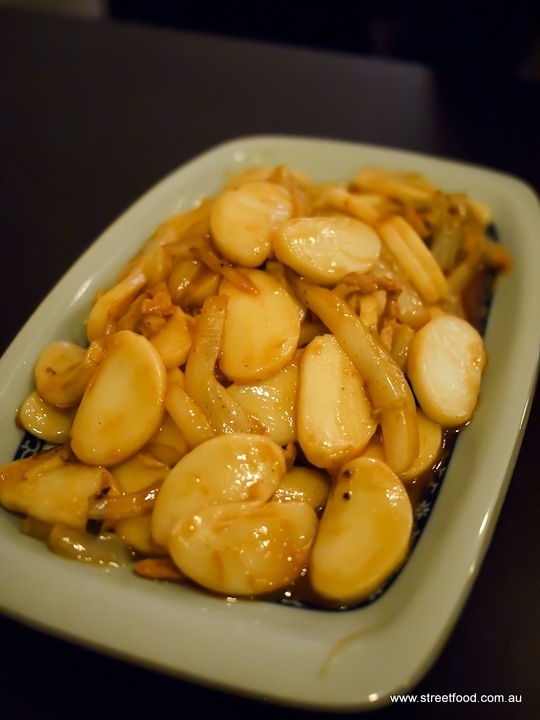 Rice flour cakes with XO sauce - $10.80. We're HUNGRY and these fried stodgey babies go down a treat. The sauce is subtle and there's a surprise thatch of pickled veggies and sliced pork in the middle. Very happy. Garlic Egg Plant with Hot Pot - $11.80. This is sensational though oily, as eggplant dishes are. It takes a little while to prepare and come out, but it was worth the wait. This dish wouldn't be out of place in other cuisines, it's almost Turkish or Greek in style. Shawn indulges in his love of stir fried shiny things - beef with plum sauce - $12.80. The beef is lightly deep fried, possibly in a little rice flour, so the outside is blistered rather than super crunchy. It is drizzled in plum sauce rather than smothered so it doesn't go gluggy. The snow peas are a nice bonus. This is delicious but we reckon it would lose it's impact if eaten takeway, best eaten straight out of the wok. Zhenghao Restaurant is at 83 Enmore Road Enmore. Ph 02 9590 8218. I wish I could have some right now! I haven't been here in a couple of months, but want to go more often to support a restaurant on Enmore Road that isn't Thai! Have you checked out the new Mexican joint a couple of doors up? We feel the same way - it's an easy place to walk by and it's worth supporting. The Mexican place isn't high on our to do list, but it seems popular, especially when there's a show on at the Enmore. Had a meal there in first week... hmmm, not sure that anyone was sure how to take the order, serve, etc... ,BUT was dissappointed with the offering but had potential, so have been back 5 times since. Lovely hosts, (what a difference when someone cares that you came in and ate)... we will support any one that tries. PS embarrassingly the sweet and sour pork that a friend ordered was fantastic! The eggplant looks so good! I love eggplant hotpots but always end up burning my tongue!